Snowbound in the Yukon: Slow and steady. The last week has been a rush, rush time. We did our usual killed commute to the City and back. We did a bit of grocery shopping and that was about it really. So I'm stocked up for the winter, I need to go back again on October 1 for my crown finally. I got two teeth pulled on Friday afternoon. The healing is going well, only took advil for two days and the pain hasn't been bad but I have some good pain tolerance. 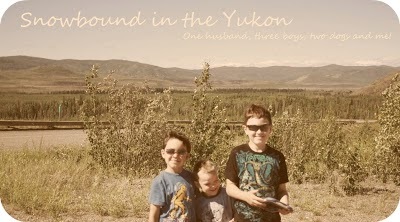 We got back from the City and the next day Hubby, SmartGuy and I took a river rafting trip. It's only a 2 hour ride down the Klondike River that joins into the Yukon River. It's not a fast ride or anything, our rivers are only a 1 on the scale, not sure what the proper terms are. It was a nice relaxing raft though. We didn't see much wildlife except for about 24 eagles, some beautiful Bald Eagles and a bunch of adolescents. I took as many pictures as I could but really my camera isn't that great with the zoom and some weren't very good. The next day Sunday we went on a family jount up the Dempster Highway a ways and stopped at the R-22 which is a First Nations Land Selection that has been developed into a retreat. It has cabins, wall tents and a cook shack. There are places for camps, outhouses and it's right by the river. It's very beautiful there, oh and tons and tons of berries but I hadn't brought anything to pick berries in. Next weekend is a Wellness retreat with lot's of fun activies such as drum making and oh, I forget I'll have to look at the schedule again but I think I'll be going out there for that, looks like a lot of fun. Over the last two weeks I've been slowly putting into place my resolve and plan for healthy living. I've slowly started exercising again in the way of walking and stretching. Eating has been a big concern for me so I'm still working on a plan for that but I've been getting lots of support at 3fatchicks.com. Trying to figure out what I need to do and of course signed back up over Sparkpeople again and restarted the plan. So I'm finally in that place and I'm pretty happy about that. I'm not going to dive right in but I'm more going to ease my way in as I have when I started this back in 2005. Hard to believe it's been that long, I really regretted losing those 6 months of healthy living I had but I'll get it back again. I'm feeling good about it. It doesn't sound like you guys ever stop, eh?! Good for you for getting things going with your exercising and all! :o) Are you working on food too, or have you been pretty good with it?